The earliest recorded theater in California is Sacramento's "Eagle Theater," which was assembled in October of 1849 out of packing crates (the stage), canvas (the walls) and some tin (the roof). San Francisco was a relative late-comer in terms of building a theater, but several impromptu theaters were created. The first recorded performance was on June 22, 1848, was a series of songs and comic impressions by Stephen Masset, a part-time lawyer and journalist performing as "Jeems Pipes of Pipesville. "(2) The first year of the gold rush saw a circus and several minstrel shows. By the 4th of July, 1850, Dr. David "Yankee" Robinson had built the 200 seat "Dramatic Museum" on California Street. In the early 'fifties, a theater on the precarious landfill of the waterfront sank several inches under the weight of the crowd! Also in 1850, a bartender and hacks driver from New York City, Tom Maguire, opened an 800-seat theater called the Jenny Lind on October 30th. The rowdy populace of booming San Francisco embraced the theater at a time when the rest of the country viewed it with moral disdain, and Maguire's establishment was popular from the start. Although its owner was illiterate and profoundly ignorant of the stage, presentations of King Lear and Hamlet were as popular as more mundane fare such as burlesque and minstrels. It's been estimated that between 1850 and 1859 there were more than 1,100 different pieces performed in the city, which averages about 110 new productions each year. "Since touring companies were still unknown and each play was cast and rehearsed here, San Francisco emerged as an important independent producing center." ("The Theater of the Gold Rush Decade in San Francisco," 1935, Joseph Gaer). In contrast to the theater companies, actors did tour the country, so the city saw many famous performers, including Junius Brutus Booth (brother of Lincoln's assassin). In a scandalous deal in 1852, Maguire sold his third version of the Jenny Lind to the city for use as a city hall. In 1856 he built the Maguire Opera House which featured the most modern appointments, such as gas lights. Knowing that controversy would pack the house, Maguire presented the (in)famous Adah Isaacs Menken in a then-shocking performance of Mazeppa in 1863 (she rode a horse on to the stage in a beige-colored body stocking -- apparently quite risqu by the standards of the time). By 1865 the booming theater business--which had always been covered in the city's papers--spawned The Daily Dramatic Chronicle (later known simply as the San Francisco Chronicle, and one of two--sort-of papers to exist in the 1990s). Started by Charles and Gustavus deYoung for the princely investment of twenty-five dollars (premiere issue was January 16), it promised to cover "the actions, intentions, sayings, doings, movements, successes, failures, oddities, perceptions and speculations of us poor mortals here below." The attempts by moralistic politicians and preachers to reign in the city, which started as early as 1850 when a widely ignored law forbidding gambling houses and theaters to operate on Sundays, reached a certain degree of success in 1864 when another Blue Law was passed. On December 20, 1864, Maguire lost in a hearing before the state Supreme Court and had to agree to closing on Sundays. 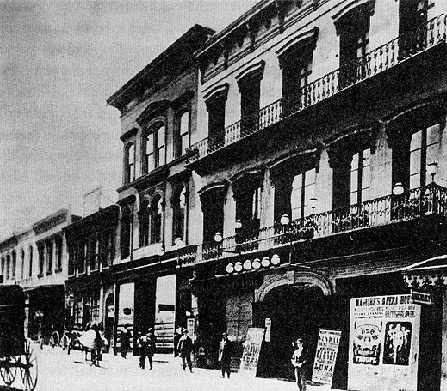 In 1876 The Baldwin Theater opened on Market Street, and by 1877 Maguire was the manager of the place. It is here that we meet Salmi Morse and "The Passion." 1) Constance Rourke, "Troupers of the Gold Coast," Harcourt Brace, 1928, pg 22.